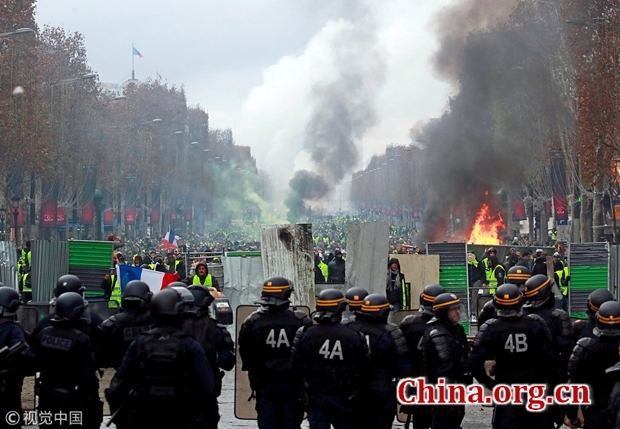 Around a hundred thousand people took part in close to a thousand protests all around France on Saturday, according to a BBC report quoting the French interior ministry. While most of them were peaceful, the ones in Paris were violent, with approximately eight to thirty thousand protesters rioting at any given time. The smell of burned tires, and the sight of broken barricades greeted international journalists in what looked similar to the Euromaidan protests in Kiev in 2014. Although the massive clashes in the capital were smaller in size compared to past French riots, they were still significant enough to shake the foundation of the current standard bearer of the "liberal international order" French President Macron, whose current approval rating is in the low twenties – a sharp contrast for someone who until recently was considered the next European hero. Macron was of course disappointed. In a strange twist of irony, he tweeted that the republic should be thankful for the law enforcement and police officers, and argued against hooligans and violent provocateurs determined to create havoc. Over five thousand police were deployed in Paris, and the scenes of violence were incredible. With more than 600 injured, and two dead across France, the only hushed voices are talking about how Russian intelligence might have used social media to organize the protests which were arguably infiltrated by the far right and the far left. The protesters of course disagreed. The reality is different. The protesters are frustrated and some of them told the New York Times they were there to protest because they felt abandoned by the elites. In a country with a leader who is more obsessed with European unity, and who has repeatedly made comments about how "Gauls are resistant to change" and how Nationalism and national interests are incompatible in today's society and France's idea is to create a European empire, the common people feel abandoned. The protests which are known as the "yellow vest protests" after the drivers who have to wear them, are primarily over fuel tax, as people have said they don't have enough weekly money to buy extra food in the face of such stark austerity. This highlights two important things. First, even in the most liberal of states, there are times when order breaks down and needs to be retrieved through force. The idea of a liberal order is paradoxical as order, at times, needs to be enforced, and that by definition means that not everyone will be satisfied. Some European states, which believe the world has entered a post-modern age, are increasingly baffled as they realize that nothing has changed. Austerity measures imposed upon the people of Europe, combined with stunted growth and mass migration has led to decreased jobs, productivity, and social welfare -- breeding discontent and violence, with no end in sight. Second, social media is an incredible medium of chaos. Western states were cheering on social media when Arab regimes were being toppled, and protests were happening in Ukraine, but now uncontrolled social media is being used to organize mass movements in Europe and the U.S. and no one has any idea how to control that. Finally, any leader who fails to heed the discontent of their own people sooner or later will face trouble. The chief cause is a country's economy and France has one of the highest unemployment rates in Southern Europe. France especially is quite allergic to imperial presidents, and Macron would soon realize that to his own peril, as the liberal international order, so to speak, once again eats one of its own.